I don’t know if it was a great idea or not, but I did something that I would normally never do. Like two days ago, I was oiling my twists just to keep them moisturized and it looked a little frizzy to me. I decided to spritz it with water because I figured that would make it continue to curl and sort of stick together as it had when I first twisted it. It worked like a charm. My twists looked super shiny and like new again. Fast forward to today… my head was itching me a lot. My scalp is used to being washed every four days or so. 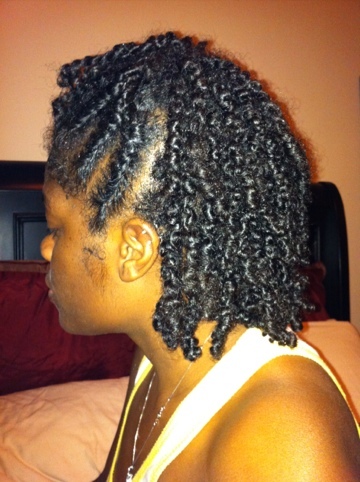 Today is day four of the twists. I thought maybe I could hold out until the weekend to wash my hair. Then I started to wonder what would happen if I washed my hair while it was still twisted. My first thought was that the twists would unravel. My second thought was that they would curl and look refreshed again. My third thought was that it would make it more of a nightmare to take them out. Well… they didn’t unravel. They do look pretty refreshed. I’m pretty certain it’ll be a nightmare to untwist when it’s time. I think it would have been a nightmare regardless though. So, it still looks good and my scalp is happy.